It's easy for cyclists to get stuck in a rut, grinding through their daily routine using the same roads and braving through the same traffic. Fortunately, all you need to do to break your habits is be open to try something new. One of the fastest growing niches in cycling is gravel grinder racing. It's fun, provides a break from traffic and doesn't cost much to get started. In fact, you can use what you already own, and with a few small adjustments you can hit the gravel at a race near you in no time. What Is a Gravel Grinder? Gravel grinders are gravel road races and rides that combine riding on surfaces such as asphalt, gravel, dirt, some singletrack trails and maintenance or B roads. The courses vary from hard-packed dirt to softball-sized rocks. The distance usually ranges between 50 and 150 miles, but can be even longer. Two of the most popular events are the Dirty Kanza 200 and the Trans Iowa, which are both over 200 miles long. 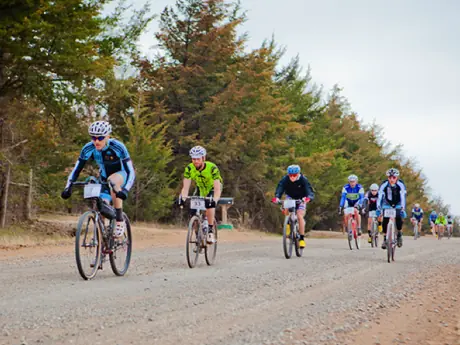 Gravel grinder races have seen a boost in popularity over the last few years. Riding on backcountry roads gets you out of the traffic and congestion of the city and puts you right in the middle of nature. And the best part is, it doesn't take a custom-built bike to experience the joys of riding through the countryside on gravel roads. Over the past few years, the market for gravel grinder specific bikes has exploded. These bikes are similar to cyclocross bikes but have a geometry that's more suitable for riding all day as opposed to short, one-hour races. The wheelbase on a typical gravel grinder bike is longer, and the head angle is slacker, allowing for a less twitchy, more stable bike to ride over rough surfaces. But even though a bike specific for gravel grinder races may make you go a little faster or be a little more comfortable, you don't need a gravel specific bike to go play on the back roads or to register for a race. Mark Orton is a USA Cycling certified Level 1 coach, certified skills instructor and certified power based training coach. Mark has a master's degree in coaching theory and strategy and is owner of SpeedWorks Coaching Group, LLC. He has also served as the head coach for the East Coast Junior ID Camp. Beyond his coaching pursuits, Mark is a proud husband, father of three boys and a professional mountain biker.